We would love to help you design the patch of your dreams or turn your logo into a custom embroidered iron on patch or design. We can accommodate a wide variety of sizes and colors. Sewing new patches takes a long time to create so there will be an extra charge for orders less than 25 items. This fee depends on the complexity of the design but is typically between 35 and 50 dollars. Orders over 25 items will have no design fee. To get this process started email us an image of what you wish to have made along with the finished dimensions and desired quantity of items. We can usually get an estimate for you within 24-48 hours. We do not charge fees to change colors on our current items. If you would like to order a current design in the current dimensions but in a different color send us an email and we can discuss your wishes. If you need a current design changed please see the Custom Items section above. If you wish to hand sew or machine sew on your patch we can leave off the iron on backing. Please make sure to check this option at check out. If you forget to please let us know before it is shipped and we can change it. 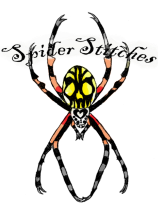 Most of our patches, lace artwork and jewelry are made to order. Our embroidery wing sets are one of a kind and ready to ship. If you need an item by a certain day please send an email. Most items will ship in a day or two. We offer a discount on orders 25 items or more. Please email before you buy so we can set this up for you.